Foxconn and Sharp are considering a $1 billion investment in a Japanese LCD plant in order to build more display panels for Apple's iPhone and other devices. C.C.Lin, an official with Foxconn parent Hon Hai Precision Industry, revealed his company's interest in the deal to boost production at Sharp's Sakai, Japan, plant this week, according to Reuters. Lin also revealed that Hon Hai is considering buying Sharp's TV assembly plants in China and Mexico, news that will likely on further fuel speculation about a possible Apple television set. The comments made by Lin are a strong sign that Sharp's recent financial struggles have not scared away Foxconn from investing in the Japanese company. One report last week from The Wall Street Journal characterized talks between the two companies as in doubt after Sharp's stock price plummeted by 70 percent in a five-month span. But Thursday's report claimed that Foxconn and Sharp may announce details of the investment as early as Friday. The two sides are reportedly still discussing a deal that would give Foxconn at least a 9.9 percent stake in Sharp. Lin said the deal hinges upon how willing executives at Sharp will be to take advice from Hon Hai officials on how to increase profits. He said Foxconn will be able to lower the cost of components for Sharp if the two reach a deal. 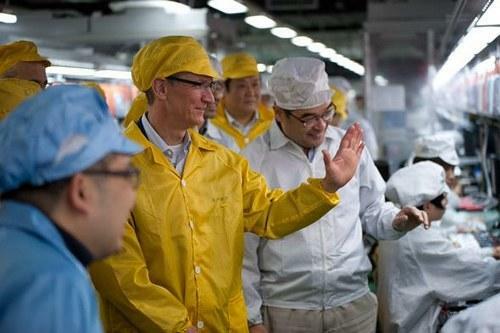 Apple CEO Tim Cook visits a Foxconn iPhone plant in March. Sharp already supplies LCD displays for Apple's devices, including the iPhone and iPad. But both companies hope that they will be able to gain a larger role in Apple's supply chain by joining together. It was first announced in March that Foxconn planned to buy a 10 percent, $808 million stake in Sharp's money losing LCD business. The terms of that deal are likely to have changed as Sharp's stock price has dropped dramatically since. Sharp's president announced earlier this month that his company is shipping screens for Apple's next iPhone, expected to be unveiled at a media event on Sept. 12. The next iPhone is expected to feature in-cell touch panel technology that will allow the touchscreen to become even thinner, allowing for a thinner overall design or more space for components like the battery.